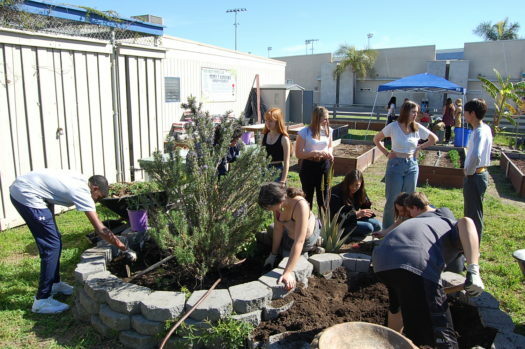 Armed with only shovels and wheelbarrows, a small group of Culver City High School students cultivate a work of art right in the middle of the campus. As the sun beats down on the concrete and asphalt that cover much of the school grounds, one spot blooms with an array of colors: yellow, orange, red, and of course the unmissable luscious greens. The Green Thumbs Club garden is that masterpiece. Club president Guillermo Salazar sees the garden as a simple way to add life to the campus. Enclosed by a wooden fence, the garden includes several planting boxes containing bok choy, arugula and other seasonal vegetables. There are succulents and flowers and a wooden picnic table under a banana tree. Aside from providing some visual beauty, the garden allows students to regularly harvest vegetables to take home to their families. “I grew up eating fresh, not just the food in the supermarket with a label that says so, but actually fresh. Grown right outside,” Salazar said. Growing fresh produce is just one aspect of the club. A banner hanging over the garden identifies it as the Henry T. Kunisawa Garden of Diversity. Kunisawa was a Japanese immigrant who settled in Culver City whose knowledge of traditional Eastern agricultural and horticultural skills allowed him to create a beautiful sprawling farm. During World War II however, he and his family were victims of the US policy which forced Japanese Americans into internment camps. After a three-year stay, he was finally released and continued his life as a Culver City resident until 1950. A year later, his farm was repurposed as a learning institute known as Culver City Senior High School. Today, in honor of a man who faced injustice, an area of his land has been dedicated to his life work of gardening and promoting the celebration of cultural differences. Just glancing at the group of students gathered in the garden, it’s clear that “anyone is welcome,” as Salazar said. Athletes, artsy types and everything in between all planting, digging, and working to keep the garden running. Club member Melanie Marx, who is a volleyball player and Girl Scout, explained why she joined the club: “I like plants a lot and I wanted to further expand my knowledge on different plants and how to take care of them.” Regardless of their reasons for joining the club, members find an accepting environment. Salazar describes the club as a safe place that offers attention and support to its members. “Every week we have sort of group therapy sessions where we just sit down and talk about things on our mind,” Salazar said. Deep conversations, jokes, laughter, and even the occasional sarcastic comment: this is without a doubt one of the most welcoming and inclusive spots on campus. “We’re really like a family here,” Salazar said. Once a patch of earth covered in weeds, the garden is an environment of growth, beauty, and diversity that will hopefully be carried on as long as the history of the school continues.